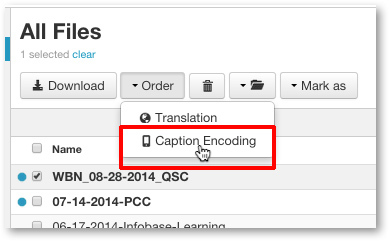 Follow the steps below to create a video with captions soft-encoded into your D2L presentation for accessible offline viewing. Select the file associated with your D2L presentation. When it has been selected, the box to the left of the filename will become checked and the line will become highlighted in blue. Once you have selected your file, click on the Options button located above your list of files. From the drop-down menu select menu select Order Caption Encoding. See more information on caption encoding. NOTE: The caption encoding process may take up to 4 hours. Upon completion, you will receive an email notification with a link to download the captioned video.